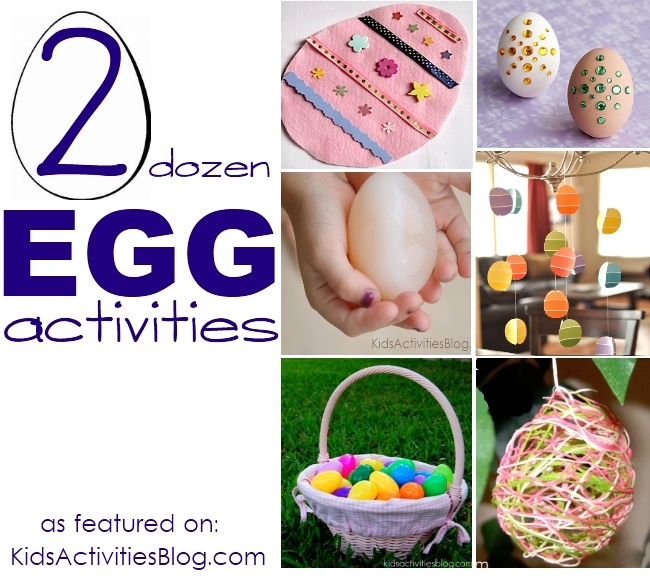 Looking for something to do with Easter Eggs? Here are more than a dozen suggestions! 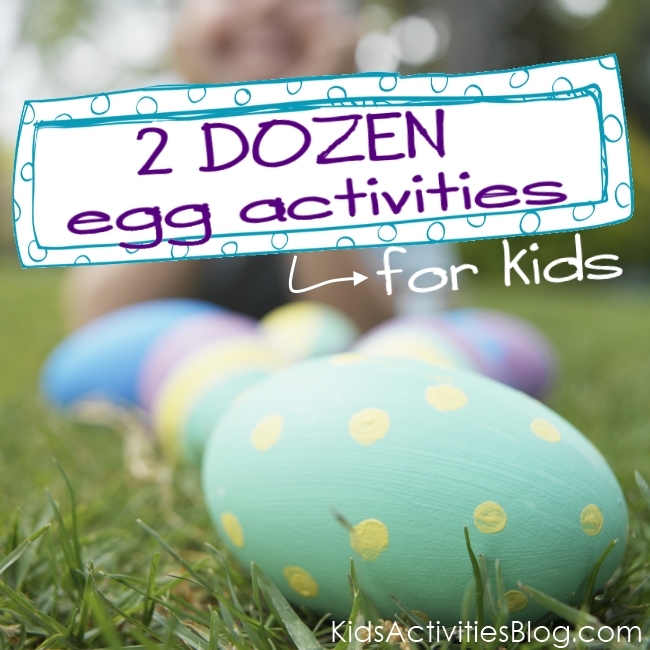 Leave a comment at the end of some of your favorite “eggy” activities. Thanks to all the It’s Playtime participants who contributed these ideas last season – Easter is a month away and we can’t wait to see the activities you will link up this year! Come back this afternoon to participate in Playtime! Watch your boys get excited about washing their hands when they get some dinosaur eggs (soap) in their treat basket this year! Create a felt Easter Egg decorating kit for your child – this would be a great quiet time activity for kids who are no longer napping. Create an Easter Sensory table using plastic eggs, cartons, pom-poms and tongs. My kids would have a blast! Who needs to use dye to decorate eggs – why not try those plastic gems – love the finished product and the simplicity in this decorating eggs method. 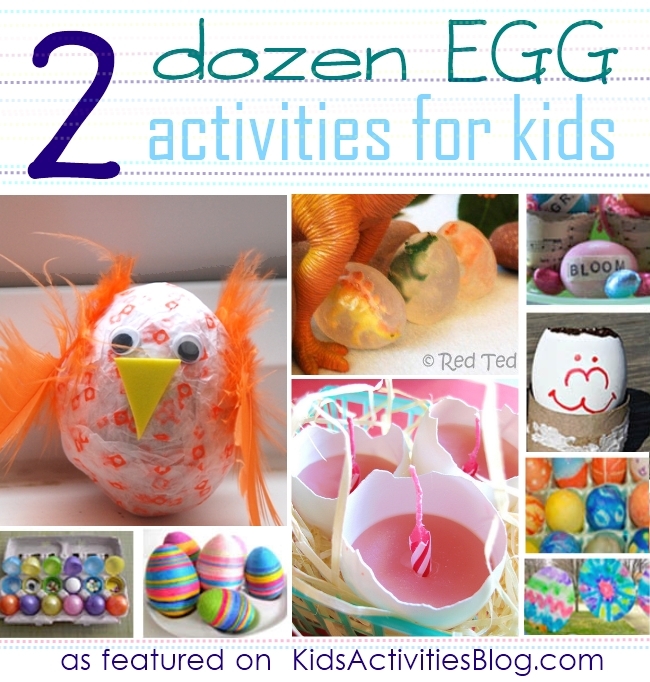 Another dye-free egg activity is decorating eggs with tissue paper – Maggy made her eggs into cute little birds. Make a hanging garland using paint chips to create egg-shapes – I love how the eggs are multi-colored and this project is easy enough for my toddlers to create. Reuse egg shells and used birthday candles to create a new flame – pour wax into the shells and use a birthday candle as the “wick”. Elle Belles Bows created a Preschool easter game for her toddlers. She put different sounds in different eggs and her kids enjoyed exploring with their ears. Craftberry Bush has an idea on how to decorate Easter Eggs she covered them with yarn – They are so bright and cheery! Allison from No Time for Flashcards covered a balloon with glue and yarn to create a see-through yarn for Easter egg art. I love this word family activity using eggs from 1+1+1. She put part of the word on one half of the egg and the rest of the word on another half, then they can switch beginning blends and ending blends to create new words. These are so easy to make – everyone loves melt-in-your-mouth peeps! Here is a great marshmallow peeps recipe. Practice counting and answering math questions with this educational Easter game: Math Egg Toss. Remember Tall Painting? If you follow me on facebook, I featured it a few weeks ago. Here is a version using half of a plastic egg, a paint lava egg. Pour the paint on and watch it swirl! Yesterday on Tuesday, has cute word covered eggs to help your preschooler learn in an Easter Activity for Kids. These marshmallow egg pops are so simple and cute! I think my kids could do this activity without me – well other than they’d probably make themselves sick – too many sticky marshmallows! Maureen of Spell Out Loud used her egg shells as a mini-planter for sprouting plants. Brilliant, a contained garden and its biodegradable. They decorated their eggs to be little gorillas. These Tie-Dyed eggs from the Chocolate Muffin Tree are made out of coffee filters, markers and a spray bottle. Fun! And lastly is a tutorial on how to decorate using glue, rubber bands, eyedroppers and more. Do a Science Experiment with eggs. Place your eggs in vinegar for a couple of day, they will swell and the shell will dissolve leaving the egg “naked”. Make an ice egg for bath-time play. Fill a balloon with colored water, add a sponge cut into a shape. Your child now has an “egg” to melt. Have an Easter Egg hunt – these are some great tips on how to make your hunt super fun! Do you have scraps of yarn? We have a massive basket – and hope to make these homemade pom-pom chicks this year. Recycle your TP tubes to create fun spring chicks. Make art – by throwing/dripping eggs. Fill blown egg shells with some paint and let them drip on a page or if you are daring, take them outside! Your kids will love pelting the fence (and the shells are good for your grass. Do you have a fun family tradition at Easter time? We would love to hear about it! Come tell us about it in the comments, or leave a link to an inspiring post on our facebook wall. 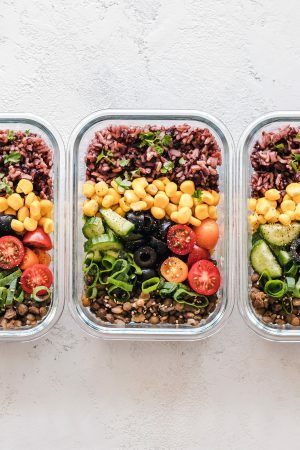 This looks great, Rachel! I’m planning to try the Borax crystal project soon — so many good ideas. Love, love, love this!!! Thank you for finding and supporting the Tailspin and can’t wait to join this hop (when I have something to add) and to do some of these wonderful things! Thanks so much for including our sound eggs. They have been a lot of fun. Excited to check out some of the other blogs too! So many fabulous ideas. I tried to add your button to my blog, but it does not appear to be working. I grabbed the one from Imagination Tree and it worked fine for me. Like Kerri, I also had trouble with the html code for the play time button. Great ideas, Rachel! You found some of the same ones I’ve been enjoying! I was planning to feature Elle Belle’s Bows sound eggs and the word family eggs in my post of Montessori-inspired Easter activities tomorrow – they’re great, aren’t they?! Visiting from Mom Loop! These egg ideas brought a smile to my face. I can’t wait to let the kids do them 🙂 We are starting a link up party on Thursdays (today:), and we would love for you to join us with this post and/or any others you would like to include. We are at allthingswithpurpose.com. Hope to see you there! !